The buzz around Priyanka Chopra’s wedding just refuses to die. While she is totally on a roll, appearing on all popular TV shows in America, writing a book, getting her very own wax figure at Madam Tussauds and shooting for her upcoming movie, the hoopla around her wedding ceremony pictures is still making people curious about how it all went. Latest in the series of ‘unseen’ pictures from Priyanka’s wedding to Nick Jonas has been revealed by one of her friends Lilly Singh. Popular YouTuber Lilly Singh, who goes by the name Superwoman on social media, showed a side of Priyanka's wedding ceremonies that will totally remind you of a typically playful jija-sali jodi. How to turn a Jonas brother into a Simpson. If I’m gonna do it, I’m gonna do it right! My sis @priyankachopra told me no mercy during the haldi (turmeric) ceremony on @nickjonas. The Haldi ceremony which takes place in the morning of the day of a wedding involves both the bride and the groom getting smeared with haldi and oil at their respective places to give them an extra glow for the d-day. But it looks like after Parineeti Chopra’s joota-chhupai stint about which she had written a cryptic tweet mentioning Nick’s generosity, it’s Lilly Singh’s saali moment that will be next endearing thing on the internet. As soon as Lilly Singh’s picture rubbing Nick Jonas with haldi-besan ubtan started doing the rounds of the internet, the trolls also made sure to judge her by exclaiming that she was groping the singer on purpose! 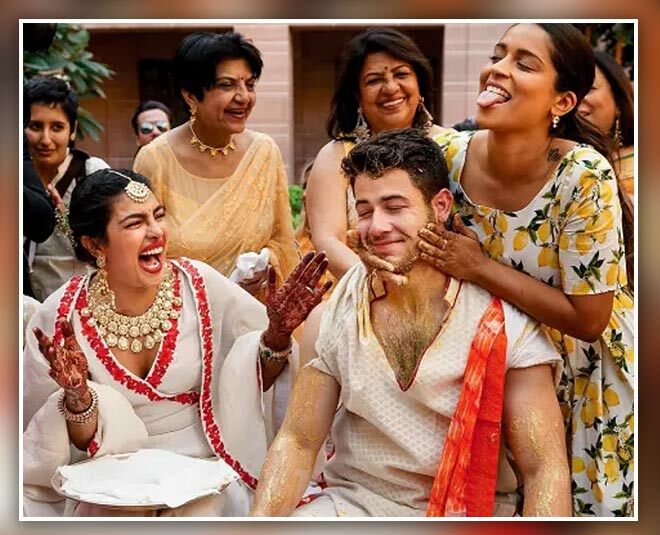 The picture however shows otherwise with a beaming Priyanka Chopra laughing her hearts out at the ‘ritualistic manhandling’ while Nick Jonas is sportingly getting smeared with fun. Fans of the couple were quick to point this out and wrote how it is all in good joke. Priyanka looked resplendent in a white angrakha kurta with an embroidered red border while Nick also had a traditional white look even as the relatives and friends dressed up in yellow as per Hindu customs. Priyanka Chopra had collaborated with Superwoman Lilly Singh for a video on How To Be A Wing Woman which was a hit on YouTube and the two had looked like the ultimate buddies. Seems like when the time came for Priyanka to have a dependable bridesmaid at her wedding, Lilly took the mission pretty seriously! Akshaya Tritya 2019: Gold Jewellery Pieces Every Bride Should Possess! Haldi Ceremony Is Always Fun! Looking for interesting peek into the lives of your favourite celebs or for some fitness or beauty inspiration from them? Then keep reading Her Zindagi.